11-11-2013, Hoorn, The Netherlands. Every year on 11 November children from the catholic parts of The Netherlands go and celebrate Sint Maarten. In the days prior to Sint Maarten they make a lampion at school and walk along the front door and hope that by singing songs they receive a treat. 11-11-2013, Hoorn, The Netherlands. Ieder jaar op 11 November wordt er door de kinderen uit de katholieke delen van Nederland sint maarten gevierd. Op school maken ze dan een lampion en ze lopen langs de deuren. Ze hopen dan door sint maarten liedjes te zingen dat ze snoepjes krijgen. Every year in 11 November children from the christian parts of The Netherlands celebrate Sint Maarten. 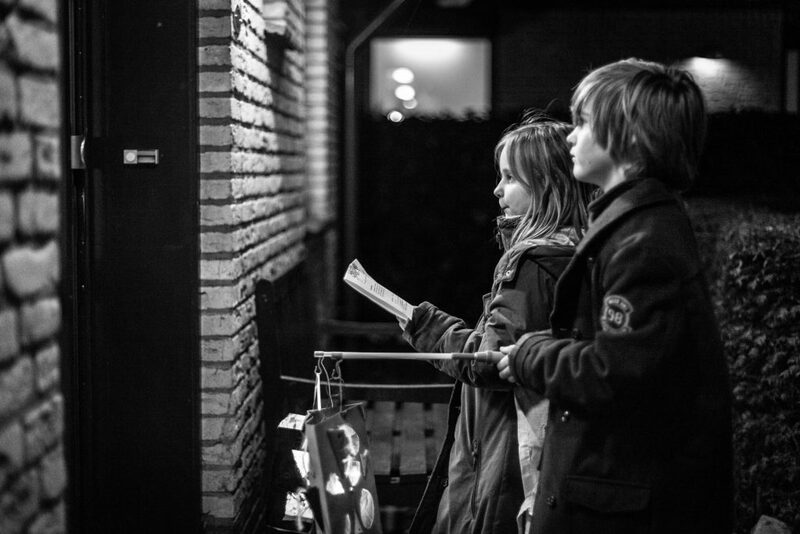 In the days prior to 11 November the children make a lampion at school and walk along the front doors of the neighboring houses to sing songs and receive a treat. I will be giving street photography workshops shortly. Are you struggling as a street photographer? Are you stuck in a creative rut or fear photographing on the streets? Do you want to know more about how I work the scene and create my images? Then go to the workshops page and check for a planned workshop near you. If you have a question, please get in contact via the contact page. Or subscribe to the newsletter.